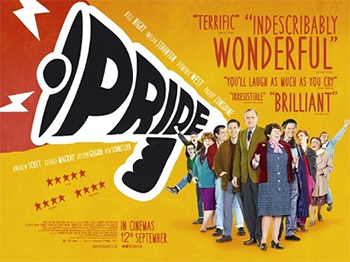 Emotions were stirred at Middlesex University by a special screening of the BAFTA-winning film Pride. The movie, which tells the story of the Lesbians and Gays Support the Miners (LGSM) alliance that rallied behind British coal workers during the strike of 1984-85, features the character of Middlesex's very own International Applicant Advisor Gethin Roberts (pictured left) played by Sherlock star Andrew Scott. Gethin is also a member of the recently formed Middlesex LGBT Staff Forum, which hosted the event alongside the Students' Union LGBT Assembly. He was joined for a Q&A after the screening by the film's writer Stephen Beresford (pictured second from right), who spoke the power of proximity in defeating prejudice. In the film, LGSM raise money to support an at first reluctant mining community in Wales. The two groups form a strong bond that later sees the miners marching with LGSM at Gay Pride 1985. Since Pride had its premiere it has inspired several spin-off groups including Lesbians and Gays Support the Migrants, of which Gethin is an active member. He said that he hopes the film inspires more people to become activists and support oppressed groups of people. 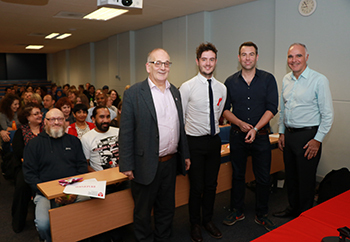 Middlesex is currently working to become a Stonewall Diversity Champion - the organisation's Client Manager Pete Mercer attended the screening (pictured second from left) - and Gethin believes this will show that the University takes equality seriously. "I think it has an impact on the experience of staff and students knowing they are working in an environment that is LGBTI-friendly and supportive," he said. "It's really pleasing the senior management of the University have brought into it and provided funding." Nursing student Orla Hillary, who leads both the LGBT and Women's student assemblies at Middlesex, said that the Students' Union is also working hard to improve LGBT provision for students. "There are many LGBT students at Middlesex and one of the main points when I got elected was to build up the LGBT network," she said. "We've now got active Facebook and WhatsApp groups and meet up all the time, so it's really come up, and it's been great working in partnership with the staff LGBT Forum to put on joint events. We want to walk together in the Pride in London parade so we're trying to build up both our communities so we've got a good family." Director for Corporate Engagement David Williams (pictured far right), who leads the LGBT Staff Forum, said: "I actively encourage staff and students to support these forums either as a member or an ally. "Everyone is welcome to join us as we move together as one University."